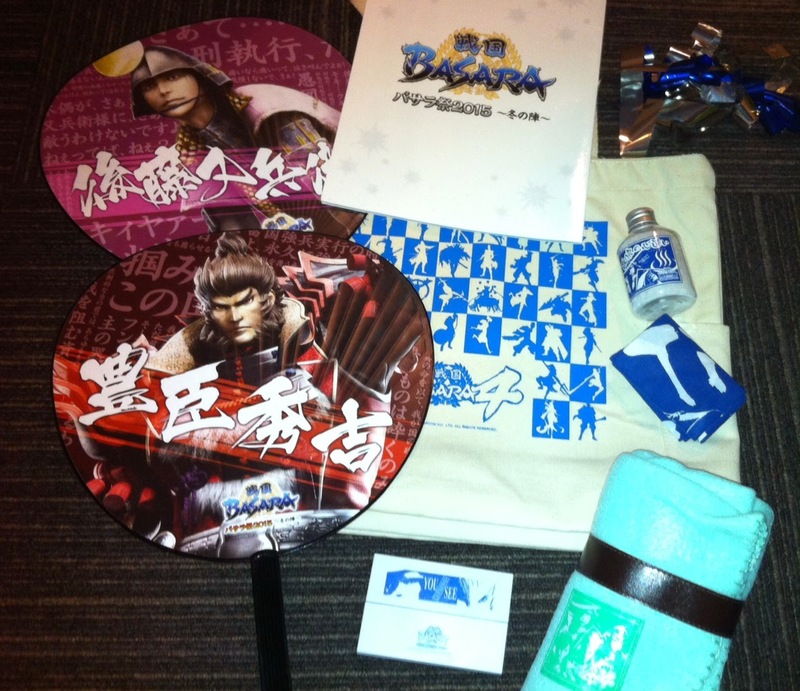 I booked a flight to Japan to attend today's Basara Matsuri 2015 ~Fuyu No Jin~ (hereafter abbreviated to Basara Matsuri) in a moment of madness after way too many months of overtime at work, and that's where I've spent most of the day, soaking up the festival atmosphere and enjoying being around my fellow fans. It's already been confirmed that there will be a DVD recording released in June so I'll add a second post reviewing everything properly when that happens. This is just a basic event report; please understand that I might have omitted or misremembered a few details since watching the show a few hours ago! Basara Matsuri 2015 ~Fuyu No Jin~ was held at the colossal Nippon Budoukan in the heart of Tokyo's Kitanomaru park, the same site which hosted the fifth anniversary celebration back in 2011. There were two performances; one in the afternoon at 14:30 and one in the evening at 18:30. 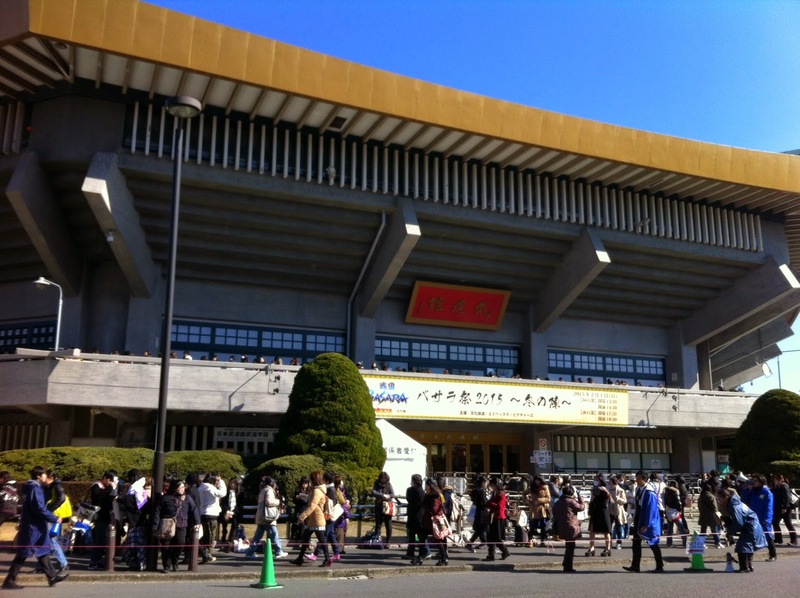 With the venue being so large, obtaining tickets was much easier than usual - even though there were more fans in attendance than at the previous Sengoku Basara event. The evening show was also broadcast live to audiences in cinemas all across Japan to ensure as many people could watch as possible. Tickets cost ¥7,000 for attendees and ¥3,500 for those who saw the show at one of nineteen selected cinemas across Japan; given that I'd estimate that there were around 6,000 people watching each performance live and several thousand more spread out in the cinemas, organising this kind of event was a very big deal. Naturally, the advertised guest list was suitably impressive. I arrived at the venue some time before the Basara Matsuri merchandise went on sale, but not early enough to obtain any of the kanji initial charms which were completely sold out within 45 minutes of sales commencing despite a limit on how many each visitor was allowed to buy. Apparently some people were already queued up before 7:00 even though it was a bitterly cold, windy day! 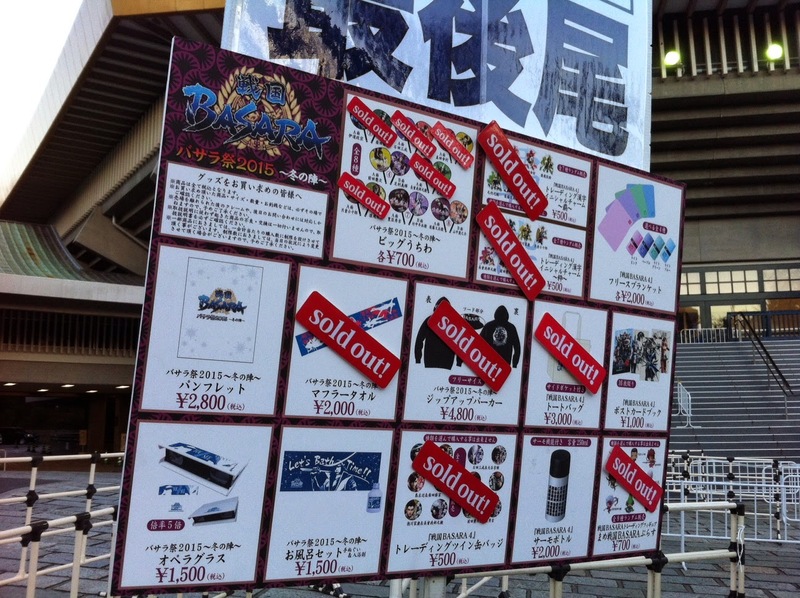 Getting up early was definitely advisable as most of the goods had sold out well before the Budoukan doors opened to admit attendees for the afternoon performance. 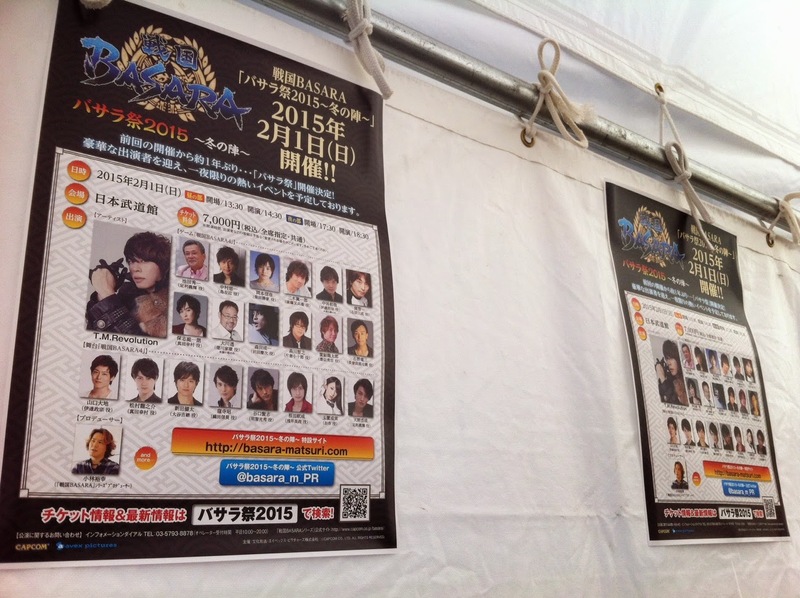 There were also additional tents for purchasing T.M.Revolution CDs and viewing autographs from the seiyuu guests. These were queue-free and much easier to navigate. After stocking up on overpriced-yet-desirable merchandise, I waited around nearby then headed in to take my seat in the arena for the afternoon show (my evening seat was miles away on the first floor - even fan club members have a hard time getting good tickets when demand is so high). The afternoon and evening performances followed the same plan with some slight variations so I'm going to describe both together where possible. Both shows opened with the traditional 'rules and regulations' skit. In the afternoon, the audience was greeted by Sakon who claimed it was a Toyotomi army festival and didn't seem to be taking anything very seriously. Katsuie corrected him and went on to read the rules in the most depressing way imaginable, comparing everything to his beloved Oichi. The evening version had Kojuurou waiting for Masamune then trying to impersonate Masamune's unique style of speech in his place - and failing. Masamune then turned up and started reading the rules in English. Kojuurou stopped him, then tried to set a good example by reading the next rule properly. Unfortunately the next rule on the list was about mobile phones and used a lot of modern Japanese loanwords which Kojuurou kept stumbling over. He wasn't actually any better than Masamune after all. 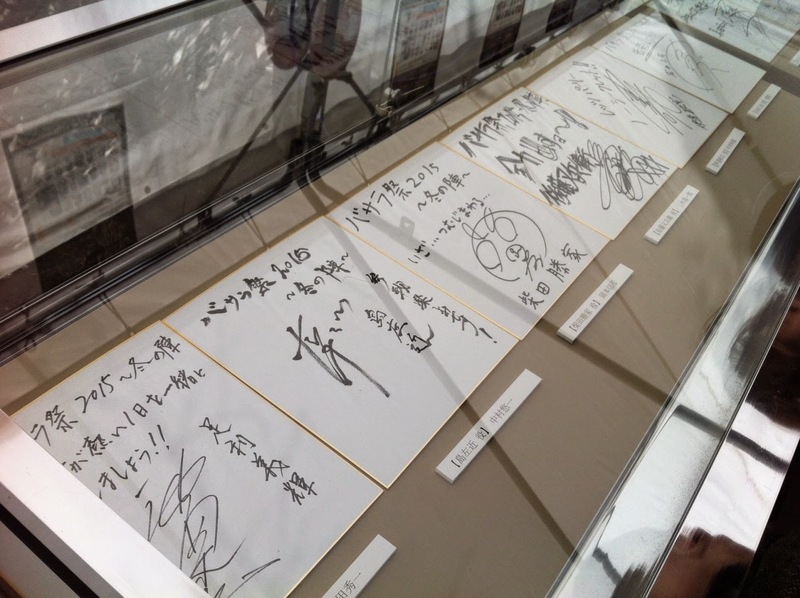 The first of the main attractions was an abbreviated Butai Sengoku Basara 4 performance with all of the actors. There was some ad-libbing (especially from Mitsuhide) and some of the special effects were missing without the specialised stage design they'd used in the original stage play. The best part was still the Azai couple's scene. I will never get tired of watching Nagamasa charging in with a flying kick from offstage to 'rescue' a (perfectly capable) Oichi, then defending her from Katsuie. Once the live action version of Ashikaga Yoshiteru had closed the stage play segment, the focus shifted to the voice actors and the first set of live readings. They'd chosen a selection of the most popular scenes from Sengoku Basara 4 to perform and padded them out with some original Basara Matsuri dialogues. I remember one where Katsuie meets Yukimura for the first time (Yukimura was very sweet and respectful, even with Katsuie being a negative jerk). In another, Matabee goes looking for Masamune and is furious when he only finds Kojuurou instead. After everyone had participated in a dialogue, Morita ushered all of the seiyuu on stage and then brought out KobaP and Nishikawa. Nishikawa jokingly introduced himself as Sakai Tadatsugu's seiyuu so that he could feel included in all of the voice acting conversations, then moaned about how few lines he had and yelled Tadatsugu's "REVOLUTION!" to get the audience involved. Okamoto tried out his dream of getting the audience to respond too by shouting out "Who am I?". He was crestfallen when they shouted back "KATSUIE!" and had to explain that he had wanted to hear "KAIOU!" (his wish was fulfilled later on when the fans got the hang of it). Next came the popular 'variety' activity; a team game involving all of the seiyuu and stage actors at once. The actors were divided into Eastern and Western teams and the prizes on offer were humble - strawberries for the afternoon show and Shingen-themed snacks for the evening one. The afternoon activity was a snowball fight where members of each team had to throw white balls at pictures of generals from the opposing team while one or two people defended them with paddles shaped like snowmen. This was quite funny; Nitta tried to defend while sitting down like Gyoubu and couldn't reach high enough even when jumping, while Takahashi was so intimidating with his bouncy defending that Seki and Miki ended up throwing snowballs at one another instead of hitting the targets. Nakamura declared that Mitsunari's head was 'simply too enormous' to defend (each team leader had a larger target) and protected Sakon's picture instead, then Okamoto did the same with Katsuie's. Their strategy worked - neither Sakon nor Katsuie was knocked down in that round - but Morita was appalled at the way the newcomers had abandoned their lord! In the evening, the team game was a simple round of 'Oyakata-sama Ga Koronda', the statue game from one of the Takeda stages in Sengoku Basara 4 where players have to sneak up behind Oyakata-sama without being seen. In the Basara Matsuri version, a dozen people were playing at once and trying to place their team's flags in a rack directly behind Oyakata-sama. As for the person playing Oyakata-sama, it was yet another surprise guest - Nakamura Kazuto (Takeda Shingen from the stage plays)! He came out fully dressed in his armour with his axe in one hand, making his sudden twirls to try to catch people more dangerous-looking than usual. It was a fun game, especially because the stage play actors kept fooling around (Takahashi incorporated some rolling and jumping into his creeping forward). The seiyuu made the game harder by waving to the audience as they moved forwards. At one point, Nakai and Okamoto became entangled somehow and each successive 'freeze' made it worse until Okamoto was flailing on the ground with his flag sliding halfway across the stage. After all of the silliness, it was time for something more serious: the latest round of Sengoku Basara announcements from KobaP! He revealed that there will be a '10th anniversary' project which will run between July 2015 and July 2016. It will be accompanied by a special insignia based on Masamune, and we can expect to hear more about the various activities planned as part of this mysterious project later. The highlight of the information bulletin was the screening of the very first promotional video for Sengoku Basara 4 Sumeragi, which is scheduled to appear on the official website tomorrow (Monday 2nd February 2015) at 10:00 Japan time. I'm going to describe as much as I can from memory - I'll be flying back home tomorrow when the video is released so please forgive me if I make any mistakes which go uncorrected for a few hours. It's very hard to pay full attention in a festival atmosphere. The video opened with the new '10th anniversary' insignia then went straight into a CG animation of the Sumeragi logo. The first character showcased was Sen No Rikyuu; we got to hear both Wabisuke and Sabisuke. Sabisuke sounds cool and has an evil laugh. The scene which has Rikyuu performing a tea ceremony in front of Hisahide (from last week's Dengeki PlayStation magazine) was shown. It seems to play out with Hideyoshi confronting Rikyuu and ending up stabbed (?!) with a tea whisk (?!). He's then lying prone on the ground while Sabisuke calmly greets Hisahide. I think there was a shot of both personalities shedding a tear. The movie then cut to his gameplay and showed Rikyuu levitating and performing all of the moves we've seen in screenshots. He can soar through the air. There was a scene where he's levitating with rocks. Masamune seems confused. The audience was howling with laughter for the entire time Rikyuu was on the screen. Every time he did something involving tea, people laughed even harder. The next character to be showcased was Maria. She was a hit with the crowd too. In one cutscene, she's using her cloth like a skipping rope and toying with Sakon, who keeps prancing around inside it. The scene where Naotora is carrying her like a princess follows on from a cutscene where Naotora is wrapped up in cloth; Maria manipulates the cloth and abruptly drops herself into Naotora's arms. The sleigh-riding move where she makes soldiers drag her around the battlefield looks hilarious in motion. Maria can still fight while suspended in mid-air - I didn't notice whether it was a Basara attack or a regular move (I'm starting to see why so many characters are getting aerial move upgrades lately). Speaking of move upgrades, there was a little footage of Masamune and Mitsunari in action but it flashed by too quickly for me to notice anything important. Characters showed in anime cutscenes included the three we've already seen, but there was also a scene of Masamune battling Yukimura in classic over-the-top Production I.G. style, and a scene with Motonari and Motochika which had the crowd screaming with excitement. In one segment of the video, they demonstrated the 'battle roulette' outcomes by showing the player transforming into the Akatsukimaru and a soldier. If you looked carefully, you can see Kasuga and Toshiie set as partners in the bottom left which strongly indicates that they're playable, given the way partners work. I think they were deliberately chosen for the video as a hint to their fans. The second time I watched it I realised the player starts out as Shingen in the transformation sequence. So unless this is a really cruel trick and Shingen himself is a transformation, I think it's safe to say that he'll be fully playable. One scene which made everyone gasp was a glimpse of a cutscene with most of the series' major characters all lowering their heads to Yoshiteru. The video ended with them all jumping out into an exciting group pose. At one point there was a shot of Yoshiteru and Keiji sitting side by side as though they were judging or commentating on something. The video is accompanied by T.M.Revolution's DOUBLE-DEAL which will serve as the game's opening theme song. The other surprise for KobaP's information bulletin was that he brought out another special guest: Sakurai Takahiro (Sen No Rikyuu) - though Okiayu had joked that he was backstage earlier in the show, so it probably wasn't as big a surprise as it could have been. Sakurai said he was quite interested in Sengoku-era history already so seeing a famous name like Sen No Rikyuu being reimagined this way was strange, but he was deeply excited about the role and liked both Wabisuke and Sabisuke equally. Next came the second half of the live seiyuu readings, which was much like the first except that each show had one exclusive preview from the next game. It was through the title card for these previews that we learnt that Yukimura is the first character confirmed to have an anime route in Sengoku Basara 4 Sumeragi (and indeed, the first outside the main three who has a confirmed story at all). The afternoon show had a live performance with him encountering first Ieyasu, then Hideyoshi followed by Yoshiteru, all during the course of one stage. A different excerpt from the evening show featured a traditional Masamune/Yukimura fight where the two of them disregarded their main quests from Sengoku Basara 4 and charged into battle with one another instead. 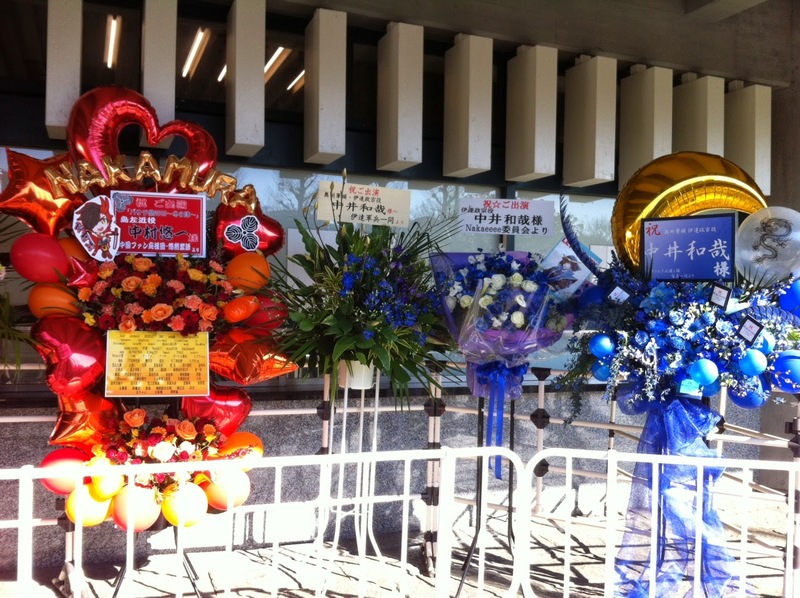 The show closed with the promised T.M.Revolution mini-concert. A few hours earlier, I had been waiting to enter the venue for the first performance and happened to find a nice place to sit in the park next to Budoukan. By chance, I found that I could hear the final rehearsal for the show taking place inside and thus knew the set list in advance: it was Count ZERO, Naked arms then FLAGS (my excitement at the illicit discovery waned slightly when I opened the official event pamphlet and found that Nishikawa had confirmed the songs he was going to sing there anyway). They're all great songs so the mini-concert was a blast, and I feel lucky that I had a bonus audio-only preview. Nishikawa is one heck of a performer live on stage. 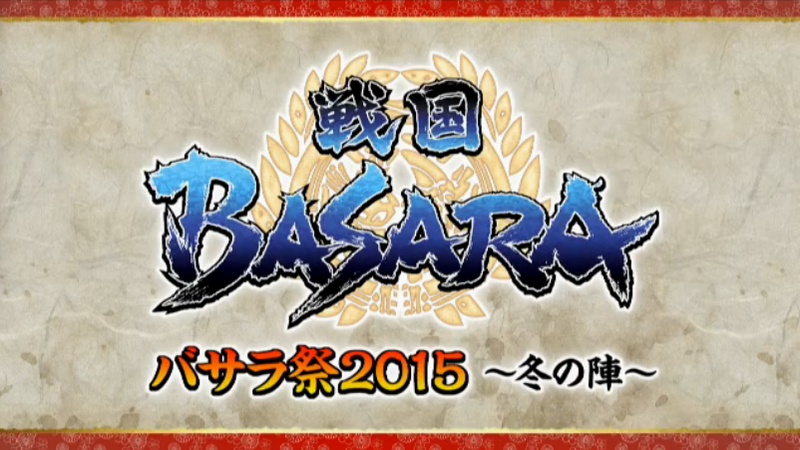 And with that, the curtain fell on another Basara Matsuri event! Does the trailer shows gameplay for the Brogun? I think so, though it's not as prominent as the sections for Rikyuu and Maria. I'm sure I remember seeing a few quick shots of Yoshiteru in action (like his move to freeze time), unless that was a still shot and I've mixed it up in all the excitement. Just three more hours to wait!